Over the extended Christmas holiday, some of the team are sharing what plug-in of Software they have learnt this year. It doesn't have to have been released this year, just something they have learnt and integrated into their workflow. Eli Krantzberg's selection is Elevate from NewFangled Audio. As an author of tutorial videos at Groove3 and a team member of Logic Pro Expert, I get to see a lot of new software come across my desk over the course of a year. And these days it is, almost without exception, all excellent. They usually fall into one of two broad categories: creatively stimulating or bringing added functionality to routine tasks. I almost always vow to myself to include these great new tools in my future composing and/or mixing. Unfortunately, some fall by the wayside for no other reason than lack of musical context or opportunity to use them. One new plug-in that stands out however from 2017 is Elevate from NewFangled Audio. 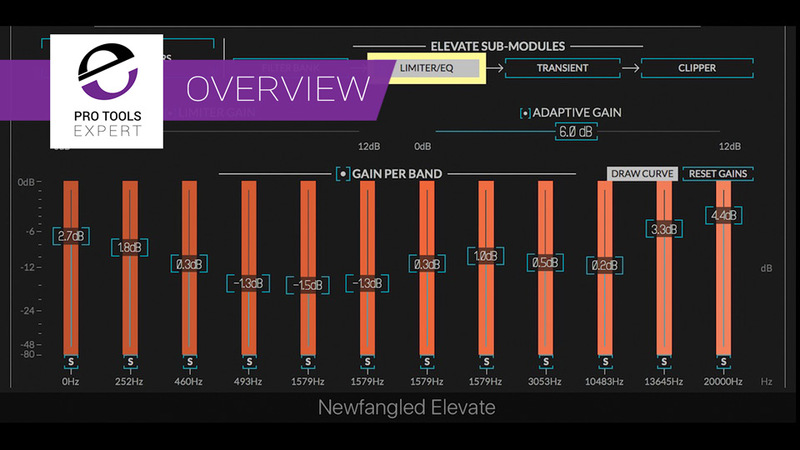 Elevate is a new take on multi-band mastering. It splits the signal up into as many as 26 individual bands. And each band, in addition to traditional limiting, can also have its transients tweaked, and spectral clipping applied. As geeky as this may sound, it actually sounds fantastic. What makes this plug-in so special is the use of adaptive algorithms to calculate optimal limiting, transient shaping, and spectral clipping for each band. I find the adaptive analysis to be a great starting point that gets me 90% of the way to optimum settings. I have been using this on the stereo output of my final mixes lately for some quick and simple in the box finalising of my mixes. I have found twenty-six bands to be a bit of overkill. I am getting great results with a simple five-way split in most cases. Each split point can be manually adjusted. Here is how I set it in my last mix. By lowering the top bands I can bring out some nice sizzle on the ride cymbal, and air in the vocals. I then usually go in and experiments with the transient emphasis values. Using judicious amounts, this really helps the transients pop in specific ranges. I love adding really subtle amounts of the spectral clipping. A shape value of 5% keeps things nice and smooth across the spectrum. And just a few percentage points of drive is usually more than enough to add some subtle fatness and warmth. Newfangled Audio is a new company doing all the right things. 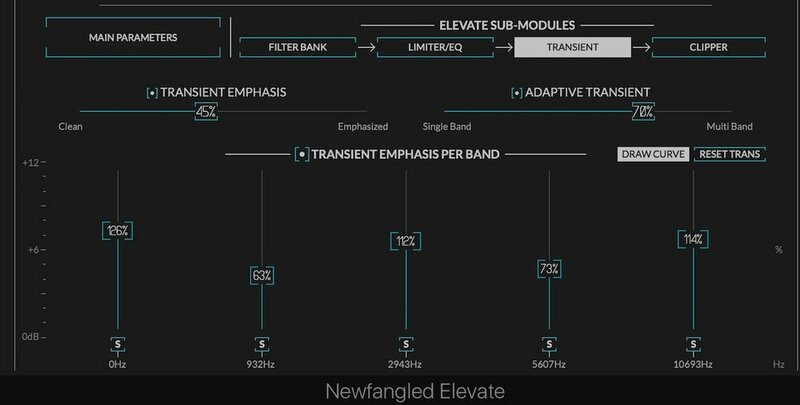 Straight out of the gate they have re-imagined equalization with EQuivocate, and now multiband limiting with Elevate. I can’t wait to see what they come up with next. This is definitely a plug-in developer to keep your eye on! You can read the rest of my Elevate review on Logic Pro Expert.